The best way to describe the scent is a lollipop from hell. Chocolate and grape are the smells I'm getting out of this. I could be wrong. After the first sip, it's not too bad. Very bizarre. There is a lot going on, approximately four things going on according to the folks at Jones. Mostly though it is fruity, potent (in a good way), and quite refreshing. Normally I don't include a picture of what the actual drink looks like outside of the bottle, but I sort of can't resist this time. It's difficult to tell from this picture, but at most angles it looks grey, like dirty water. 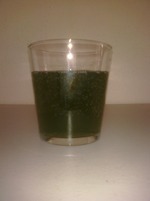 It also has a greenish tint to it. This is a soda you have to try if you're into trying sodas. If you're not, why are you here? It's refreshing and definitely a "taste explosion." A conversation peice of sodas, so to speak. In the end, I swear this tastes like a melted down Tootsie Pop, which I don't like, but for some reason it works as a liquid. 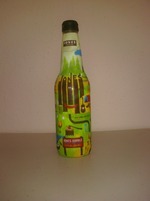 Along with the decent flavor, the creativity inside and outside of the bottle add a lot to this one.